AQ Khan and Samar Mubarakmand, flanking the man in the blue beret (believed to be General Zulfikar Ali). Reproduced from the Nuclear Weapons Archive. A.Q. Khan is easily the most famous person associated with Pakistan’s nuclear program. By fostering the image of being the “father” of Pakistan’s Bomb, he gained public acclaim and the protection of the state — even after his entrepreneurial activities seriously weakened Pakistan’s national security and caused great embarrassment. How much Khan was freelancing, and how much he was operating under high-level guidance, will remain very murky. Khan contributed significantly to Pakistan’s bomb program by spiriting out of Holland designs to manufacture centrifuges, and by setting up a Uranium enrichment plant at Kahuta. But A.Q. Khan was hardly the brightest light in Pakistan’s nuclear firmament. This distinction may belong to someone little known in the West: Dr. Samar Mubarakmand. Let’s open the shoe box files to learn more about Mubarakmand. He joined the Pakistan Atomic Energy Commission in 1962, which sent him to Oxford to receive a doctorate in physics. A.Q. Khan enriched uranium (and himself); Mubarakmand had more consequential assignments. Beginning in 1983, He conducted the first and subsequent “cold tests” of Pakistan’s bomb designs. He was also the man in charge at Chagai when Pakistan tested those designs in 1998. Mubarakmand was additionally responsible for developing and producing Pakistan’s solid-fuel missiles. Samar Mubarakmand has avoided the spotlight as much as A.Q. Khan welcomed it. A while back, Scott Sagan passed along to me transcripts of two of Mubarakmand’s rare public addresses that shed light on his contributions to Pakistan’s nuclear and missile programs. These transcripts also suggest that he and A.Q. Khan are not the best of friends. The true father of the Pakistani nuclear program was Dr. Rafi Muhammad Chaudhary. He migrated to Pakistan from Aligarh University and established the Physics Department at the Government College Lahore. The PAEC (Pakistan Atomic Energy Commission) was told that whenever you were ready, you would detonate a bomb. So we were all very enthusiastic. We were running day and night concentrating on our effort. But…the mandate was withdrawn from us when we were ready. On the morning of the 11th of May , one of our friends, in the Armed Services, phoned me and said, “Have you heard the news today?” I said, “What?” He said, “The Indians have conducted the explosion in Pokhran.” So I said, “Congratulations.” I was genuinely happy. He said, “You are congratulating us on the Indian tests?” I said, “Yes, because now we would get a chance to do our own tests. The PAEC… is an island of excellence… Our life expectancy is 122nd in the world; in the literacy rate, we are the 162nd, and in per capita income we are the 122nd. The access to health services gives us a ranking of 148, and in clear drinking water we are 114th in the world… In nuclear weapons, we are the 7th in the world. Nobody works in our organization for money or fame. We do not believe that sensitive work can be done by publicizing it. It should be done quietly, and so there is no lust for fame in this organization. There is honesty, dedication. I can tell you this – the miracle of teamwork I saw in Chagai. We were there for about 10 days. The PM (Prime Minister Nawaz Sharif) had told me, “Dr. Sahib, please do not fail, we cannot afford to fail. IF WE FAIL, WE CANNOT SURVIVE. (Emphasis in prepared remarks.) This is an hour of crisis for Pakistan.” He was dead sure that if we failed, they would have attacked our nuclear facilities. AQK was the business-man/ring-leader and not the brains of the Pak. nuke weapons program. He is a metallurgist and not even a physicist. Incidentally, the whole “How much Khan was freelancing, and how much he was operating under high-level guidance, will remain very murky.” is a bit of a myth. He may not have had high level guidnace but his actions were implicitly blessed by the Pakistani government. Between 1994 and 1998, Khan paid over a dozen visits to North Korea. By 1998 aircraft of the Pakistan Air Force and the Air Force-run Shaheen Airlines were carrying missile components and nuclear enrichment equipment and materials between Rawalpindi and Pyongyang. Hard to do that without a government (or at least, Defense Dept.) authorization. He had a free hand to do as he pleased. Just like the current kleptocrats in power, Paksitani govt. is run like a fiefdom. A holdover from the mugal era I suppose. Pakistan’s nuclear history has been effectively falsified in favour of AQ Khan as part of a deliberate state policy of nuclear ambiguity since the early 1980s. However, the nuclear program, including all fuel cycle and nuclear weapons design, development and testing projects were being run by PAEC led by Mr. Munir Ahmad Khan, Chairman, 1972-91. Dr. AQ Khan joined PAEC’s uranium enrichment project, begun in Oct-Nov, 1974, as Prinicpal Scientific Officer under S.Bashiruddin Mahmood, in early 1976, but managed to take over the project by July and then have it separated from PAEC the following year. Dr. Samar Mubarakmand served under Mr. Muhammad Hafeez Qureshi, head of the secretive Directorate of Technical Development of PAEC (DTD). It was this DTD that carried out all nuclear weapons development and testing, including the cold tests and the 1998 hot tests at Chaghi. DTD was set up by Munir Khan in 1974 under Qureshi to coordinate the work of all the specialized groups working on the nuclear device. 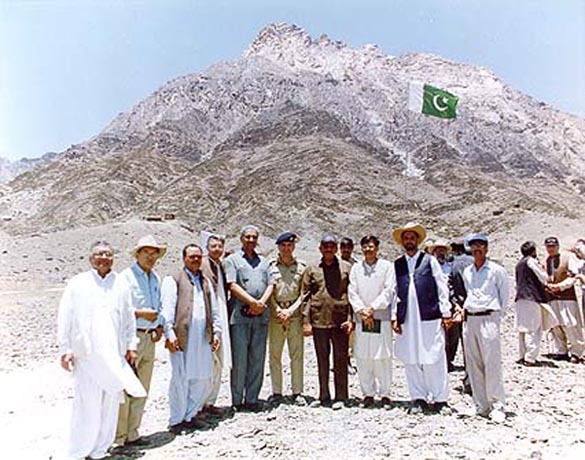 Samar got famous because he, as Member (Technical), PAEC, was responsible for nuclear testing in 1998. It is true that he headed the Diagnostics Group in DTD and then as head of the National Development Complex, set up Pakistan’s missile program. As for enrichment, PAEC was responsible for providing the UF6 feed to AQ Khan’s KRL, who then handed back the enriched UF6 to PAEC for conversion into metal and machining into cores. PAEC was also running a parallel Plutonium route, during the 1980s and New Labs was ready during this time and work on the 50 MW t production reactor at Khushab as commenced in 1985. Therefore, AQ Khan was heading up only one project, while Munir Ahmad Khan was heading over 20 such labs and projects in PAEC. On a more basic level, instead of thinking of AQK as the uranium proponent and Samar (and PAEC) as the plutonium proponent, its also helpful to look at their stances from a different view. AQ’s network, largely in Western Europe plus North Korea, is now well documented. But we should also not forget Samar’s Chinese ties, so maybe its helpful to think of him in regard to the Chinese connection. In that light, is it not surprising that the programs with which he was involved ultimately proved more fruitful?? Also, there is at least a reasonable amount of information now slowly coming out that various elements of the Pakistani establishment didnt act against AQK sooner becuase he was a useful distraction away from the truly important parts of their nuclear weapons program: the ongoing shift to a plutonim-based arsenal with associated weaponization work. lastely, although Samar has shunned the cameras and media this decade, there was a time (late 1990s-2001) where he was more than happy to talk as he was engaged in a kind of PR war with AQ, who was very much his rival. A very helpful and important insight — thinking about the Pakistani nuclear program in terms of geographical procurement. Yes, Munir Khan was hugely important. His story deserves to be told — but he was utterly unhelpful in telling it, at least to this visitor. We all await the Pakistani equivalent of George Perkovich’s book-length account of India’s nuclear program. Oxford University Press is about to publish Naeem Salik’s book, The Genesis of South Asian Nuclear Deterrence, which provides a useful, Pakistani-oriented account, but with many important bases left uncovered. Feroz Khan and Peter Lavoy are working on a much anticipated manuscript, but we shall have to wait a while longer because Peter is back in Washington. Its Indian and what do you expect from an Indian source when it come to Pakistani nuclear program?